The sun is an amazing force that illuminates our existence, provides essential support for healthy growth, and is ultimately vital for humanity and our solar system in total. As the summertime heats up early for Coloradans this year, many homeowners are considering the long-term damages wrought on their properties by the relentless force of the sun. Schroeder Roofing is proud to be your source for quality roof replacements in Loveland and Fort Collins. Since 1977, our commercial and residential roofing contractors have worked to deliver trusted and proven roof repairs and service. When needed, our roof replacement company assists in finding a new and long-lasting product that is sure to enhance the value and enjoyment of your property for many years to come. Over time, your beautiful roof will begin to degrade and break down. The sun is relentless, as its waves bring both positive and negative consequences to our planet. It is important to take the best care of your home’s roofing system to keep it in good shape for many years to come. Today, we’ll highlight how the sun affects the quality and integrity of your residential or commercial roofing. If your roof looks like it’s on its last legs, be sure to contact our roofers for expert assistance! We’ll start with something everyone likely knows. We’ve already set a couple of heat records this year, and with temperatures reaching the mid-nineties in early June, it’s likely that a lot of hot temperatures will beat down on your roof. While some homes rely on metal or ceramic tiles for overhead protection, most Coloradan homes are equipped with asphalt shingles. These black, tarry products absorb a lot of heat while relying on oil for flexibility and longevity. Shingles are made with chemicals and oils to create a balance of protection that provides durability from a wide range of weather patterns while still being conscious of costs. This weatherproofing provides a valuable seal against the elements, and once it wears away, your shingles will quickly begin to fall apart. Shingles at this stage will begin to crumble away, exposing your home to the elements. The last thing you want to happen in your home is for water to infiltrate and create considerable health and cost concerns in terms of mold mitigation. Schroeder Roofing is here to provide comprehensive assistance if your Loveland roof is in danger of falling apart. Cooling the Home Can Be Bad, Too! Colorado is renowned for its inconsistent weather, and the big temperature changes can result in serious strain in roofs in addition to hardwood floors. Quick temperature changes result in expansion and contraction, moving in strain against other materials and fasteners. 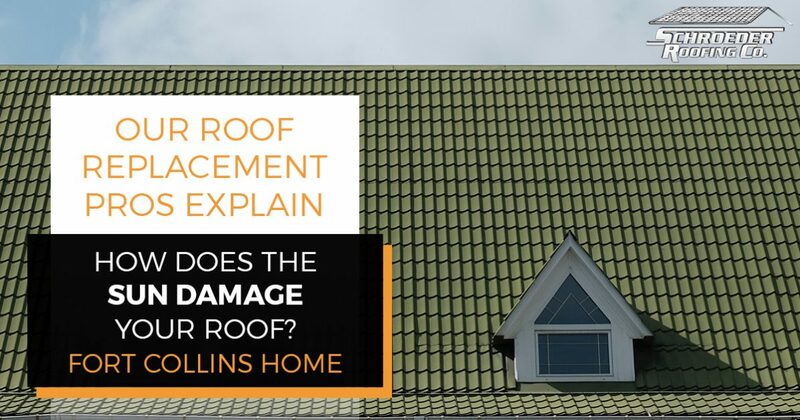 Over time, your roof can break down to the point that integral elements become at risk for damages. Your gutters and flashing are both essential for keeping water away from the home, and if either one were to fall apart and fail, moisture could quickly begin to infiltrate the structure. Exposing your home’s wires and insulation to rainfall can prove very hazardous. If you are concerned about the condition of your roof after rapid weather changes, be sure to reach out to our Loveland roofing contractors for assistance! Modern science can now explain the hidden danger behind sunlight — ultraviolet rays. This radiation is constantly beating down on your Colorado roof, breaking down the basic molecular structure of any materials it meets to break down and degrade the integrity of your structure. These same rays can cause considerable damage to human skin after heavy and repeated exposures. Sunburns are not enjoyable, nor healthy, and the same rays that caused them are bearing down on your roof as you read this. This is a normal part of our existence, as UV radiation is unavoidable (except with quality sunscreen!). Frequent inspections. Be sure to visually inspect your roof every few months. The fall and spring seasons are often recommended, as big temperature changes and inclement weather patterns may have created recent damages. Roof repairs when needed. Be sure to maintain your roof when the need arises to ensure long-term quality. Cracks, holes, and leaks of any degree can quickly evolve into a costly problem. Proactivity is always recommended with roofing services! Roof replacements when necessary. While buying a new roof can be costly, the long-term benefits and value often make roof replacements a smart and cost-effective move. We may rely on the sun for life, but when it comes to your roofing, sunshine is a natural enemy. Schroeder Roofing is here to provide top-quality roof replacements to Loveland customers and beyond, serving the Front Range with pride since 1977. If your home or business is in need of repairs or maintenance services, our Colorado roofing contractors can provide honest and reliable assistance. Contact us today for assistance!